Remember all those frames? And the teacloth? And “Co-operation is better than conflict“? There’s been a bit more tidying up going on, and this appeared, ready prepared and kitted up. Presumably by the very same lady – or, given what embroiderers are like, possibly acquired from someone else who’d decided not to do it after all. I’ve found all sorts of half-completed needlework projects on Embroiderer’s Guild stalls! 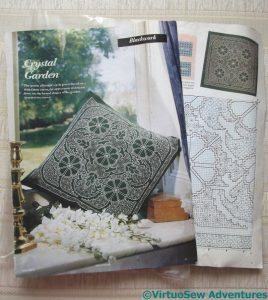 The design was in a copy of “New Stitches” magazine, but heaven knows how old it is. At least eight years, because we’ve had it tucked away that long! There’s not much of it done, so one of us will have plenty to keep themselves occupied with. In spite of Topsy, my mother is talking about taking it on. She’s much better at counted work than I am, so I’m likely to leave her to it, although I must admit it does look rather charming, and blackwork is a style I’ve yet to tackle! i’m in love with that detailed picture. 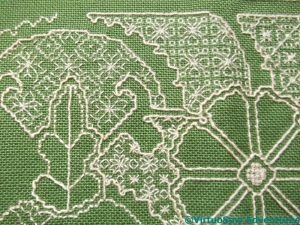 Maybe you and your mother could tackle the same design – one with the kit and one working in green thread on white fabric? So lovely!!! I love this shade of green and the white shows up so beautifully! Beautiful! And what a lovely thing to stumble upon as you tidy up. I’m sure whoever completes it will get a lot of enjoyment from the experience. That pattern is so pretty :O I wonder what the chances are I can track down a copy. What a wonderful design – I do hope to see it finished sometime soon! 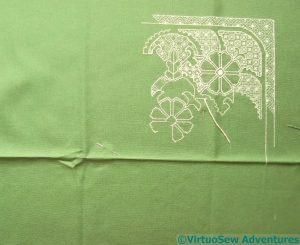 If you’ve never tried blackwork then you should give this a go. I love rummaging on the Embroidery Guilds sale table here. It is amazing the things you find and yes we have lots of partly finished things as well. I have to be very strong because I have so many UFO’s myself! That’s gorgeous. 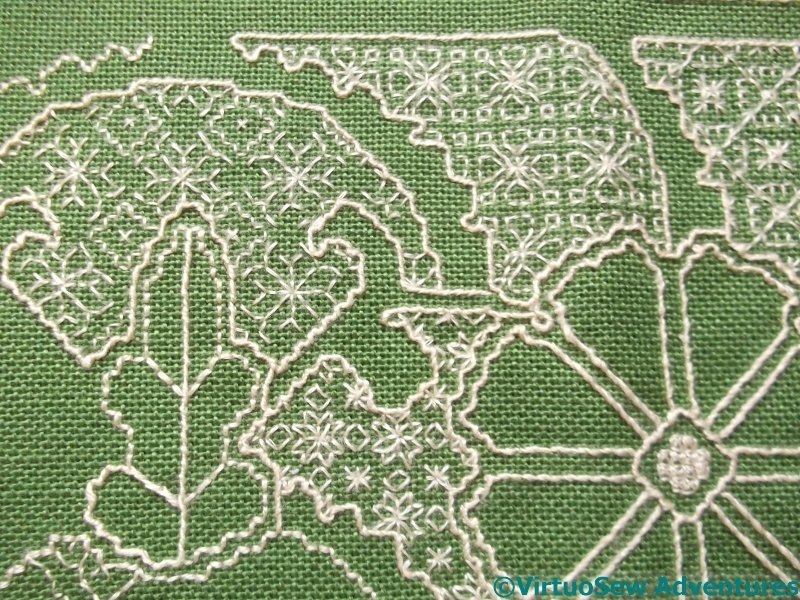 I love blackwork and this cream on green is a lovely departure form the norm. I’m really quite envious of it! this is gorgeous….love the green. Gorgeous, the cream on the green works so well. Hey so pretty! It looks like lace! What lovely embroidery! I have enjoyed perusing the last several months of your posts and I love the lace you have made for your Topsy. 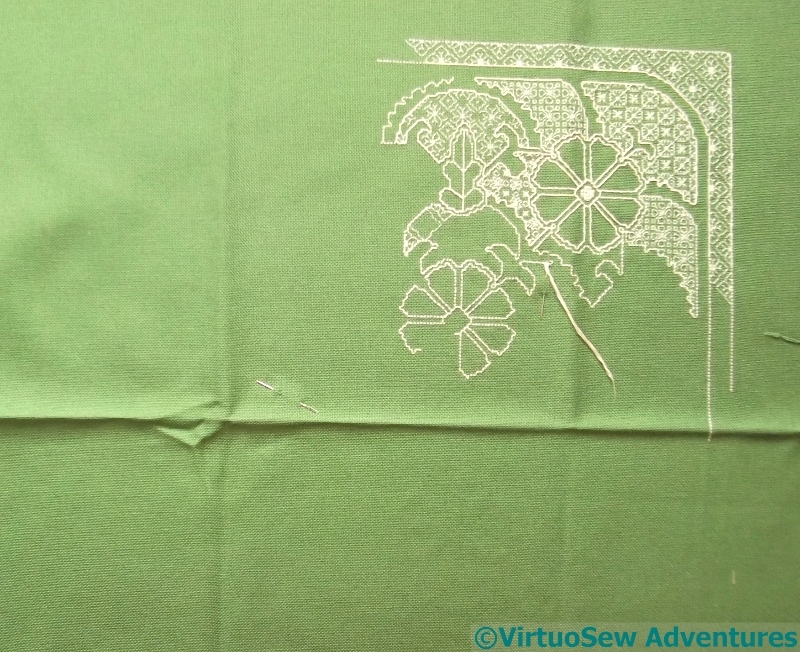 I am so impressed that you do bobbin lace so beautifully. It is nearly a lost art! I look forward to seeing the finished layette on Topsy. Thank you for stopping by my blog and leaving such a nice comment.